This is what we've been waiting for, people... confirmation of the 11th Generation finalists, the girls who will go through to Boot Camp where all the girls will get the chance to try and shine in front of the judges, and Tsunu himself, and grab the spot in Morning Musume that they all want! Well, it's exciting for me I'll say, because I really did not expect this news to come out today of all days, but it did! My first reaction was '... Eh?' and then it was '6!? 6!? That's not a lot at all!" and then my dreams of a 2-nin or 3nin member generation looked closer than I thought, so yeah, I am really quite happy with the small amount of girls, and after seeing a little bit of footage where the girls sing (they were actually shown during that pitiful snippet of audition footage we all saw a while back, which I never actually talked about, cos I wanted MORE!) or dance, I was quite surprised by the amount of raw talent that is in this audition. It isn't disappointing like 9th gen's vocals were (admit it, nearly all of them sucked) and surprisingly enough, there is only one girl I would think has been put through because of her looks or appeal instead of her vocal talent, because the girl I am talking about can't sing that well... yet. I say yet. But yeah... 6 finalists. This is serious, guys. These are the girls who could be in Morning Musume, so it's time to stake your favourites, then cry when they don't get in... or you can do what I choose to do, meaning find girls you like, and just anticipate the results. Either way, there will be girls we cling to, and girls we won't bother with, right? Anyway, I'm excited now - the raw vocal talent Tsunku has picked is quite high I guess, though I hear a lot of Hello-Onliners complaining about no 'Suppin Utahime's' in this set of auditions. Eh, that may be true, but I don't think anyone was hopeful of Tsunku picking girls who are amazing singers... then again, I have a feeling half of these people are Karin fans, and they might be a little unhappy that she hasn't been picked Still hopeful for another Fuku-chan surprise, though, aren't you? Okay, I sound like a synical old carp, and that I may be, but let's get back to the auditions, and find out who is there, shall we...? 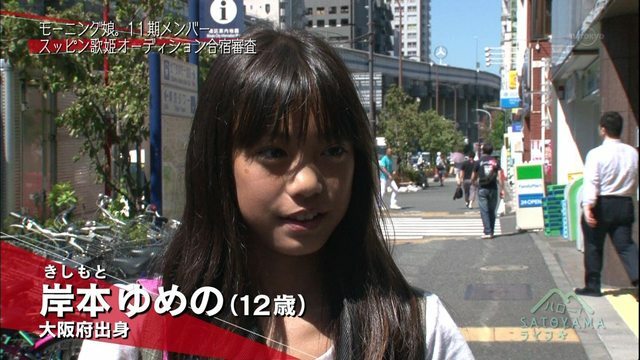 First up is Hamaura Ayano, 12 years old and a Hello! Project Trainee since 2011. This girl isn't one of my favourites, and she looks a bit like a S/mileage clone in all honesty. Personally, I could not see her in Morning Musume, but that's my opinion - not yours. Quite a few people seem to be rooting for this girl, but her voice does nothing for me, though she is pretty good. 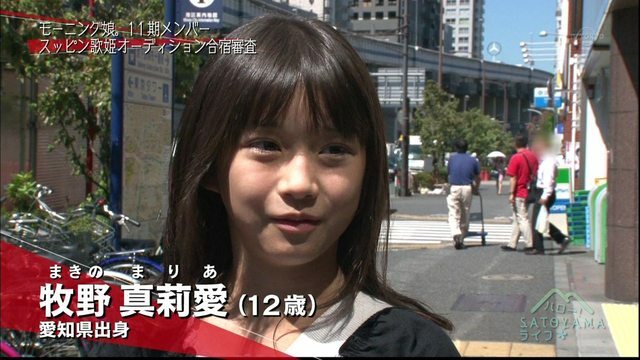 Next up, it is Kishimoto Yumeno (awesome name!) and one of the girls I am going to really root for. From the small piece of audition footage we saw beforehand, her voice is quite promising and she seems to have a good amount of control going on. She's also a cutie, I like the maturity she has going on looks-wise. Her voice is quite promising. Makino Maria is up next! She is also the girl I actually have little to no hope for in this audition, because her voice is quite possibly the weakest out of all the other girls auditioning, though she may have a different appeal that Tsunku has noticed when he saw her. She's cute, but I'm not rooting for her... yet. Wait until auditions are underway, I may fall for her. No, this isn't Mogi Manami, this is Ichioka Reina, though don't let her looks fool you, because she's a pretty good singer and has some raw talent going on. Oh, and she is a model under JS Girl, which is quite understandable, given the fact that she is really cute and has this certain appeal about her in a way. She also has a blog, so if she gets into MM, that will be sure to be shut down. Anyway, I am really digging this girl here! She's got a nice voice, and she seems to be quite good at dancing... though her legs look extremely thin, and that scares me a little. Next up... Oda Sakura, and the girl I am rooting for the most in this audition! She may not be the cutest girl to pass through to finals, but by god is her voice beautiful! There is just something about her which I really do like, she has such a happy air around her when she sings, and her smile is absolutely wonderful. This girl is wonderful, at least in my eyes, and I anticipate her performance in the Boot Camp. She seems like a strong contender, considering she is a trainee for Hello Pro and all. ... 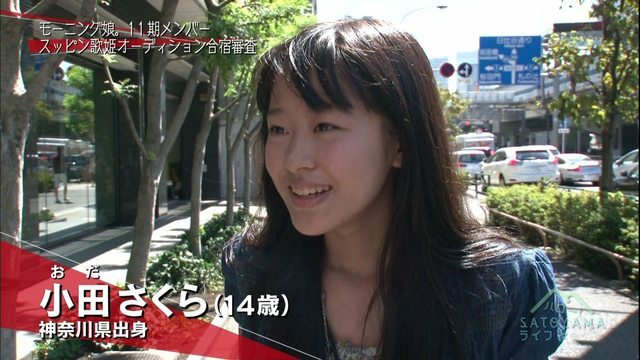 Wait, she also tried out for S/mileage (just found out) and is a rather recent egg. Hi, H!P. 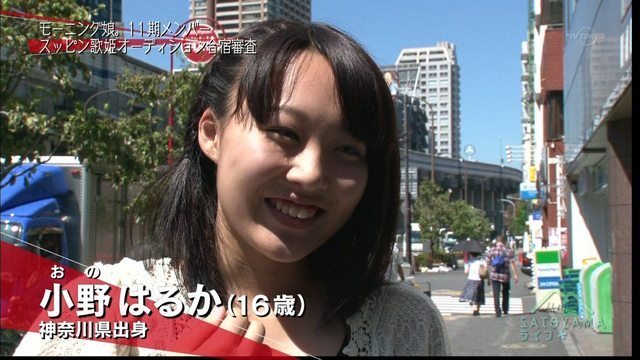 I congratulate you on adding her to Kenshuusei for 11th gen auditions. Add her... now. K, thanks, bye. Seriously, if she doesn't get in... I may cry a river, because I am already attached to her, and she's also too good for S/mileage. MUAHAHAHA. And last, but certainly not least, is the oldest finalist at 16, Nice Girl Project trainee and worked at Akihabara Backstage PASS, Ono Haruka. She seems like a pretty good singer, so I will pin her as a strong contender for this audition, though she isn't one of my favourites, but if she got into MM, I definitely would not complain. She has a mature and friendly air about her, like a big sister, and I anticipate her performance when it comes to Boot Camp. Whilst I may not be as fond as her as I am others Sakura!!!! my sister likes the sound and looks of this girl, and yes, she definitely has the raw talent, and she's very pretty. Let's hope that she can win over the judges, eh? So there are my current thoughts, and yes, I am truly excited. Probably not as excited as I was for 9th and 10th gen, but the novelty has worn off a little, so there you go, but it's nice news to come home to after college. Sungoi My Birthday, Guys, Like OMAGURD!